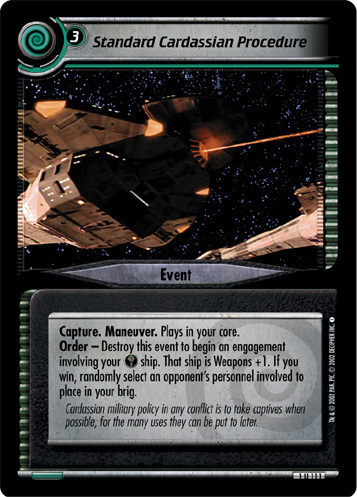 Order - Destroy this event to begin an engagement involving your ship. That ship is Weapons +1. If you win, randomly select an opponent's personnel involved to place in your brig. Cardassian military policy in any conflict is to take captives when possible, for the many uses they can be put to later. Characteristics: engagement, enhance your WEAPONS (other cards), plays in your core, Capture, Maneuver, ship related card. There are 12 entries for Standard Cardassian Procedure (ST2E 1 U 111) at the Tradeplace (4 haves and 10 wants). Click here to see all trade list entries for this Uncommon card!